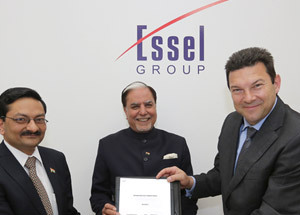 The Essel Group, one of Indias largest business conglomerates and a front runner in developing the Smart City Framework for India, has recently entered into technology transfer pacts with three leading German firms during its participation at the worlds largest trade fair Hannover Messe 2015 in Germany. This will boost the groups solar, wind energy and waste water management projects in India. The group Chairman Dr. Subhash Chandra moderated a panel discussion on the smart cities during the event, Secretary of Industrial Policy and Promotion, Amitabh Kant unveiled the Essel smart city frame work. A Memorandum of Understanding (MoU) for transfer of critical technology in wind and solar energy was signed by the Indian company today at Hannover Messe 2015 with FeCon GmbH, a subsidiary company of Wind and Sun Technology GmbH while a similar pact was also inked with Passavant Energy and Environment (PE&E) GmbH for Mega scale waste-water treatment projects in India. As per the agreement, FeCon GmbH will assist Essel in developing and manufacturing wind turbines in India along with power station and grid equipment for solar and wind energy to suit Indian conditions. On the other hand, the MoU with PE&E will provide Essel with access to groundbreaking technologies and processes in municipal wastewater, sludge, water and industrial wastewater treatment. PE&E is known worldwide for its sludge digestion technology. The Essel Group is in Hannover to showcase its Indian Smart City module for building integrated, inclusive, innovative and sustainable smart cities and is part of the Indian Prime Minister Narendra Modis delegation to Germany. The company has already received an overwhelming response to its stall at the Hannover Messe 2015 trade fair and recently inked pacts with two leading German firms to develop green energy projects and smart cities in India. Mr. Ashok Agarwal, CEO, Essel Infraprojects, said, “We are glad to announce our alliance with Schneider, FeConGmBH and Passavant Energy and Environment GmbH. We believe that this will put us on the fast track in delivering on our commitment to produce 12500 MW of solar energy and 4000 MW of wind energy in India in the coming year as also in establishing Essel as a major player in the 7.5 billion Euros market for waste water management in India. Our MoU with German partners will also provide a fillip to the ‘Make in India’ movement envisaged by our Prime Minister and will put Essel at the forefront in realizing his vision for Smart Cities in India.” Essel also looks forward to export the surplus renewable energy as the tie-up shapes up. The Essel Group is in Hannover to show case its Indian Smart City module for building integrated, inclusive, innovative and sustainable smart cities and is part of the Indian Prime Minister Narendra Modis delegation to Germany. The company has already received an overwhelming response to its stall at the Hannover Messe 2015 trade fair. Back in India, the Essel Group has taken big strides forward in realizing the Indian Prime Minister Narendra Modis dream of setting up 100 smart cities in India. It plans to invest over $2billion over the next 3yrsyears in transforming major cities across India. With a vision to enhance the quality of life, the Group associates with multiple partners to develop the smart city environment by decoding the governance policy framework. It is the only integrated smart city developer in India with proven expertise in creating single window utility corridor. The Essel Group is among India's most prominent business houses with a diverse portfolio of assets in media, packaging, entertainment, technology-enabled services, infrastructure development and education. The Group started business in 1976 with a commodity trading and export firm. Today, Essel Group of Companies is a vast conglomerate of Media, Technology, Entertainment, Packaging, Infrastructure, Education, Healthy Lifestyle & Wellness, Financial Services and Precious Metals with worldwide operations and a workforce of over 10,000 dedicated employees. The group aims to contribute to India's growth and prosperity by investing in key infrastructure initiatives including smart cities. They are the only integrated smart city developers and thought leaders in India with complete thrust in decoding the governance policy in PPP framework.